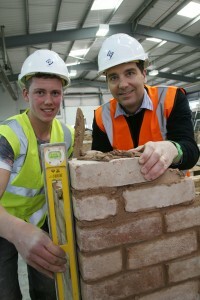 Crewe and Nantwich MP Edward Timpson built on his skills when he joined construction apprentices during lessons at Reaseheath College last week. The Minister for Children and Families visited the Nantwich college as part of National Apprenticeships Week, a celebration of the benefits that skilled apprentices bring to businesses and to the national economy by increasing productivity and providing workforce succession. Mr Timpson tried his hand at bricklaying and joinery in Reaseheath’s tailormade workshops and chatted to successful apprentices who are learning their trade at college and in the workplace. After working alongside Adam Platt, 17, a bricklaying apprentice employed by Greg Lambert Ltd in Northwich and James Lewis, 18, a site carpentry apprentice who works for his father’s building company in Stockport, Mr Timpson said: “Mr Timpson said: “Our growing economy requires a skilled construction industry, and these young people have very valuable skills to offer. The trade offers a great career path, so it’s good to see Reaseheath putting apprenticeships at the heart of their education and training programme.